Wadworth's pub not a million miles from the city centre. It has a very rough around the edges feel to it. The car park is a tip with broken glass and rubble. The interior doesn't feel much better, with paint peeling off the walls and a generally grubby feel. Nevertheless, it seems to have a loyal local following and the barmaid and locals were all friendly. They were engaging in some amusing conversations. The 2 ales were 6X & Swordfish. An added bonus for me was a real cider - Old Rosie. Despite the worn feel, I quite liked this place for some reason. They now open all day at weekends. Our last pub of the day, typical Wadworth pub (which isnt a complaint) bit of a locals pub but still a nice friendly bunch in there. Cant remember what I drank though, might of been Strong in the arm, it was in good nick. Breat ale, perfect temp too. Food is good + well worth a visit overall. Add it to your crawl. Does it say best pub food in Gloucester outside? I had a burger that was paper thin and resembled cardboard, but the real ale was good. Nice bar. 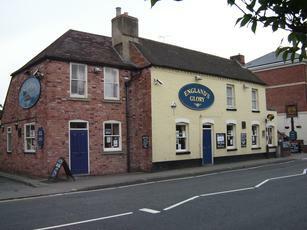 Wadworth beer, pool table, Sky Sports, friendly helpful staff. Worth a visit if you're in the area.